When we have friends to dinner, we often prepare the main course ahead. This gives us plenty of time to enjoy visiting. For night like this, we tap into our repertoire of long simmered dishes; sturdy stews are the little black dress of entertaining at home. 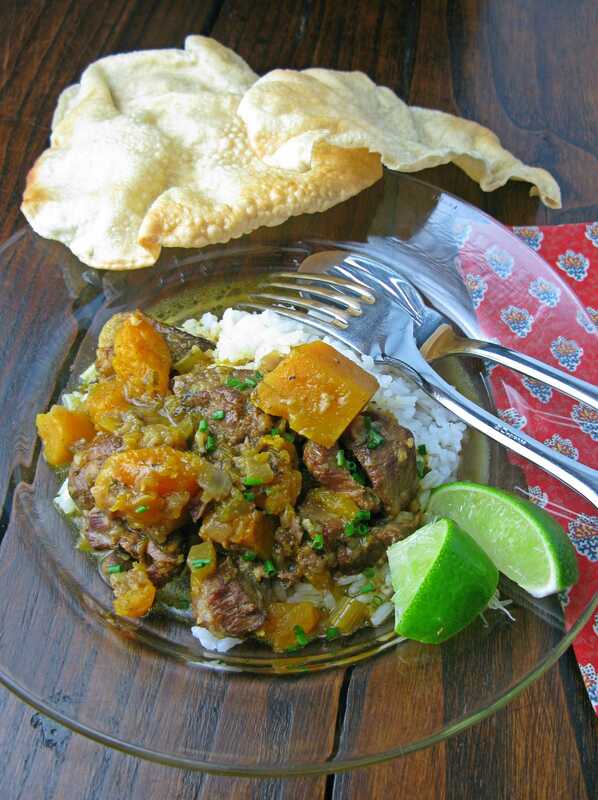 Slightly sweet butternut squash and coconut milk balance the rich flavors of lamb in this lamb and butternut squash curry, perfect for the chillier nights of early fall. 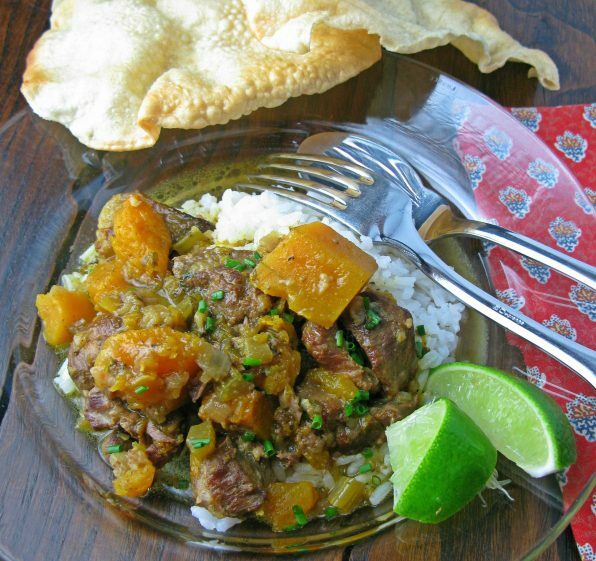 Make the dish a day or two ahead to allow the flavors of the stew to develop. Chilling also gives time for extra fat to rise to the surface and be easily removed. Lamb shoulder, the most flavorful cut, weighs 3 or more pounds and is not always available. (I slow roasted a whole boned lamb shoulder a few weeks ago and it served 10 comfortably.) 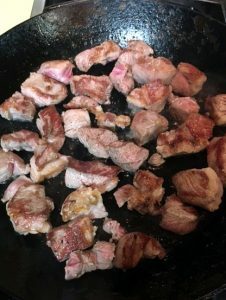 For this recipe, I chose shoulder blade chops, cutting the meat from the bone before cubing it. You could do the same or ask your butcher for cubed lamb for stewing. (For the record, there are actual butchers at the local grocery stores, Bob at Adams in Deep River for one. And of course we have the excellent butcher Cliff Ward, Cliff’s Quality Meats in Essex, CT.) Leg of lamb, a more expensive cut, could be used too but it will dry out more while cooking because it a less marbled with fat than the shoulder of lamb. You develop flavor in a stew by browning the ingredients thoroughly at each step. This doesn’t have to take much time nor a cabinet full of equipment. I like to brown the meat and vegetables in a heavy black steel pan. It’s what we used in our restaurant. The steel conducts heat and gives an even sear. A cast iron pan would produce the same results. Or you can easily brown in a good ceramic or enameled steel Dutch oven. (You’ll need this to simmer the stew in anyway.) Then as the different ingredients brown, I transfer them to a large bowl I keep to the side of my stove. The juices collect in the pan while the lamb is browning to create the fond or base that you use to make the flavorful stewing liquid. You can see the brown crust in this photo. 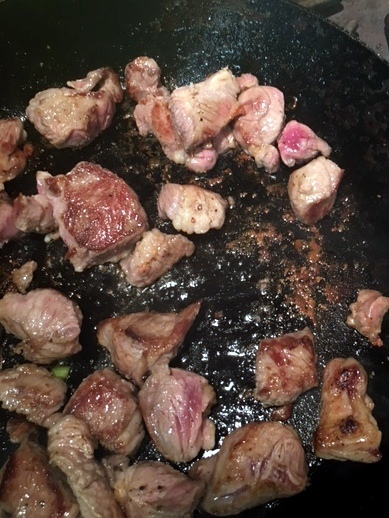 It’s essential to add water to the pan after the meat has browned to dislodge those concentrated meat juices. For seasoning, I use Maharajah Curry Powder from Penzy’s but you could use any number of curry powders or pastes such as an Indian style curry paste or Thai red curry paste. The curry cooks slowly, covered, on top of the stove or in a low oven in a covered casserole. Slow and gentle cooking preserves the shape of the butternut squash and lamb pieces. The photo below on the left is the curry before cooking and the one on the right the fragrant results. This recipe was developed to share with the reader’s of The E List, Erica Tannen’s “Excruciatingly Opinionated Guide to the Connecticut Shoreline.” It’s a weekly electronic newsletter of all that is fun, delicious, healthful and interesting in our area. Everyone who lives here reads it. You should too. Season the lamb lightly with salt and pepper. Heat a large frying pan over high heat. Add 2 Tablespoons of the oil and half of the lamb to the pan. (Spread the meat out into one layer. If the pan seems overcrowded, remove some of the pieces of lamb.) Cook without stirring until the lamb browns on one side, for about 3 to 4 minutes. Turn over the pieces of lamb and brown on the other sides. Remove the cooked lamb to a large bowl. If the pan seems dry, add another tablespoon of oil, and the rest of the lamb pieces. Brown the lamb as you did with the first batch. Remove the lamb from the pan. Add about ¼ cup of water to the pan and scrape with a wooden spoon to loosen the dried bits that have stuck to the bottom of the pan. Pour the liquid into the bowl with the lamb. Drain off all but 1 Tablespoon of the fat. Or add some oil if the pan is dry. Add celery and onions. Reduce the heat to medium and cook stirring occasionally until the vegetable brown and soften. If you think the pan is too dry and the onions are sticking, add a few Tablespoons of water and let them simmer a few minutes to soften. Add the garlic and ginger and cook for a minute or two. Dump the vegetables and any liquid in the pan into the bowl with the lamb. Transfer the stew to a Dutch oven or covered casserole if necessary. Bring it to a gently boil. Cover and place in the oven. Allow the stew to cook for 1 to 1 ¼ hours until the lamb is tender. 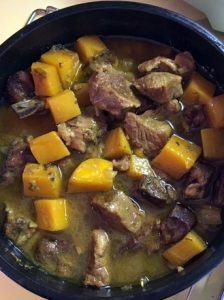 Let the stew cool for several hours or overnight. Skim off some of the excess fat. 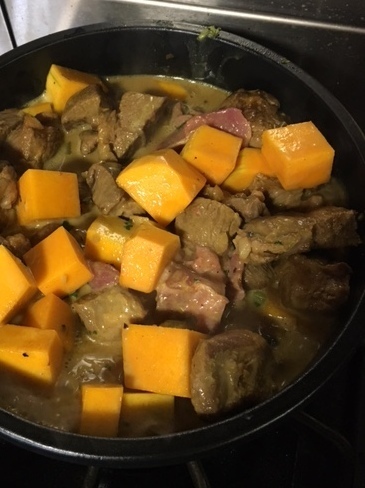 To serve reheat the stew. Serve it with sautéed spinach, cooked basmati rice, papadams, wedges of lime and chopped chives.